Margin. We all need it, but we’re too busy to slow down and carve it out. 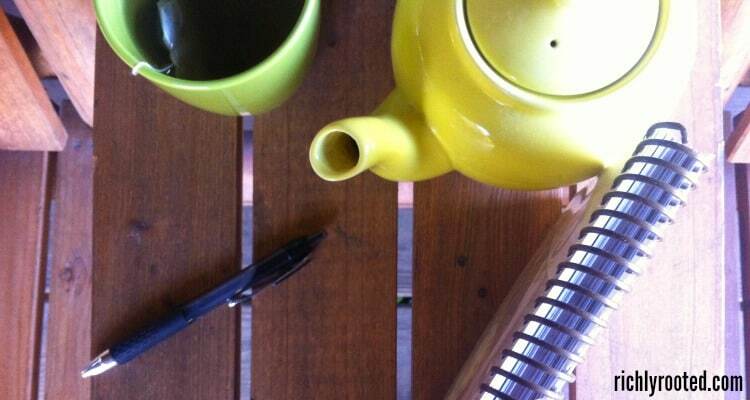 Here are two methods for creating margin in your life so you can breathe again. I’ve decluttered a lot of material things in my life: my clothes, the bathroom cabinets, and the hallway linen closet to name a few. But staring at a new calendar page this month has me thinking about my schedule. I’d like that to be simple, too. Wouldn’t you? When someone asks you how you’re doing, do you say “busy”? Are you always rushed, stressed, frazzled, and feel that there’s never enough time to get where you need to be and do what you need to do? I wonder if your problem is that you don’t have enough margin in your life. That’s certainly been my experience in the past. So what exactly is margin? Margin is unscheduled time that you can use in whatever way refreshes you or helps you get back on track with life. Margin is your breathing room. It’s your schedule’s “emergency fund” for when you’re running late or somebody throws up or you just need to put your feet up for a minute. Margin is your moment to sip a cup of tea and enjoy an orange white-chocolate chip scone. It’s your opportunity to grab 20 minutes and simplify something. Best of all perhaps, margin is the place where you can reflect on the text of your life. Everyone needs that–a space to pencil in your thoughts and ponder the words before rushing to turn the next page. Think about this: Even though the words of a book make up the meat of the story, without the white borders around them those words would be difficult to read. Our lives are the words and text, but we need that boring white space around our lives to keep us sane and focused. Prose pieces (like novels and nonfiction) have very different margins than poetry selections do. In prose, the size of the margins are predetermined. Where you end one line and begin another is determined by how large you set the margins to be. In poetry, the writer chooses where to turn each line and the margins take shape around the poem as you go. The margins of poetry and prose provide excellent models for creating more border space in your own life. In the prose approach, you set your margins first, and fit the rest of your life inside them. Decide what you want your margins to be. 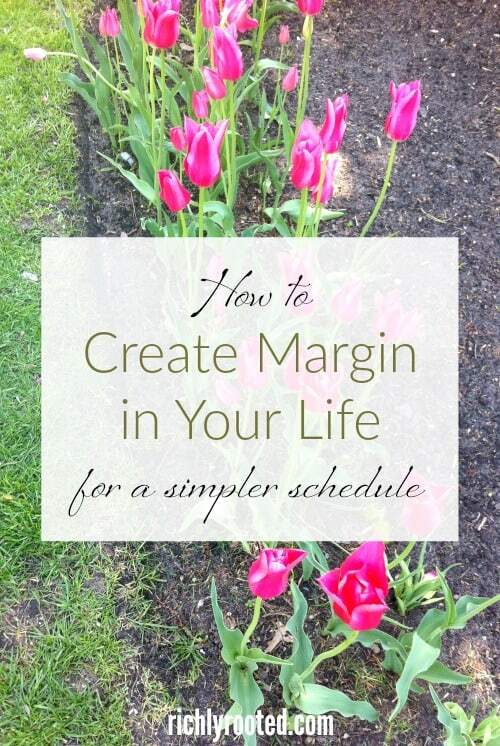 And then, don’t plan anything into your schedule that will crowd those margins out. In the poetry approach you work from the inside out. You set your schedule first, but you do it thoughtfully and with precision so that the text inside is meaningful, and margins grow naturally around it. Going on dates with my husband is really important. Taking my kids to this sport they love. When you’ve decided what those priorities are, think carefully before building anything else into your schedule. 1. Leave plenty of buffer between activities. I learned this lesson while traveling. It’s tempting to pack in as many things as possible when you’re visiting another place, but you’ll end up exhausted and crabby. Plan downtime into your day beforehand (the prose approach) or just pick a few of the locale’s highlights and focus on those (the poetry approach). The same concept applies to your weekly activities around your hometown! Whether it’s an hour earlier or just 20 minutes, you’ve given yourself time to enjoy simple pleasures like a leisurely cup of coffee, time to read your Bible, a chance to reply to emails, make a bigger breakfast, or get to work on time instead of late. My favourite time management book has lots of wisdom on creating a more intuitive schedule in the 24 hours allotted to you each day. 4. Go grocery shopping just twice per month. Instead of going every week (or every time you need an ingredient), save time and gas by planning your menus around a two-week rhythm. Here’s the simple meal planning system I like to use. 5. Say “no” to things you don’t want to do. 6. Do the dishes and tidy the house before bed. I think these are some of the signs that you’ve become a responsible adult! It’s wonderful to wake up with a clean slate, instead of feeling like you need to play catch up from the day before. 7. Avoid duplicates in your schedule. Just because Bible study is on your priorities list doesn’t mean you should do two of them. You also don’t need to take your kids to three sports or volunteer at every ministry that asks for your time. 8. Respond to emails right away. As a general rule of thumb, only open and read an email when you know you’ll have time to respond to it right then and there. Otherwise, you’ll end up reading it again and wasting time. If your email inbox is a mess right now, here are some tips for taming the beast. When you can, make a big batch of soup or beans and rice, or bake extra muffins. Freeze the extras for busy days. Here are some make-ahead breakfast freezer ideas that are easy to prep in bulk. 10. Cancel activities that are stressing you out or that aren’t necessary for you to thrive. Unfortunately, the busyness WILL creep back in and your margins will shrink. With any area of your life that you simplify, there is some maintenance required. Reevaluate your schedule as the seasons of the year and your life change. Start at the beginning of poetry or prose and fine-tune your lists as necessary. So, what will your approach be to creating margin? Poetry or Prose? What’s my approach? I find that the prose method is the best fit for me! Does your home need margin, too? 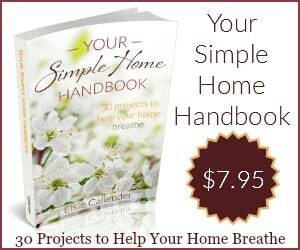 Check out my book, Your Simple Home Handbook! It’s a 100+ page guide to decluttering your home and simplifying your stuff. Work through 30 different areas of your home–at your own pace–and enjoy the benefits of a space that breathes! Click here to learn about my book! Thanks! I will definitely share at Motivation Monday! Right now, my approach is the Poetry one. I need to step down from at least one obligation but I can’t do that until the end of the school year. However, I can set priorities for my time. I’d love for you to share this great post with my readers at Motivation Monday, especially this week as I talk about creating a healthier balance for busy moms. This is a wonderful post, Elsie! What you said, “Margin is your breathing room.” is exactly what I needed to hear. I’m going to take time and work through your tips using your prose and poetry models. A terrific way to begin a new year! Such a wonderfully practical, sensible article! I felt refreshed and “marginized” just reading it… These are tips I can use right away. This year I promised myself to SLOW DOWN. You’ve provided a very helpful template for me to do that. Thanks! Thank you for this wonderful post. I love the imagery that comes with thinking about margins this way (either the prose or poetry way). I’m not really sure which approach works best for me at this point in my life. I think I need to do some contemplating and set a few more boundaries to protect my margins! Thank you! I hope you have excellent success in 2014! Your mention of boundaries reminded me of this recent post on a friend’s blog–> https://thehumbledhomemaker.com/2014/01/boundaries-arent-bad-thing-one-word-2014.html Thought you might like it! I just learned about Margins in therapy – love what you’ve written here. I appreciate your outlook – this is extremely helpful. Thank you, Annie! I am so glad you found it helpful. Thank you for telling me!